Established in 1961, we have come a long way and our stakeholders have struggled tirelessly to transform DBS (PG) College into a progressive, equal opportunity Institution that has today become the vanguard of academic excellence, on one hand, and liberal democratic traditions on the other. The college is recognized as premier institution of higher learning. The college is NAAC accredited and is a Centre with Potential for Excellence of UGC. The college has established a unique record by giving excellent university result and scoring a large number of merit positions every year. Over 225 students are awarded INSPIRE scholarship of Rs.80,000/- per annum from the Department of Science and Technology, Government of India. It is to inform all the students of D.B.S. 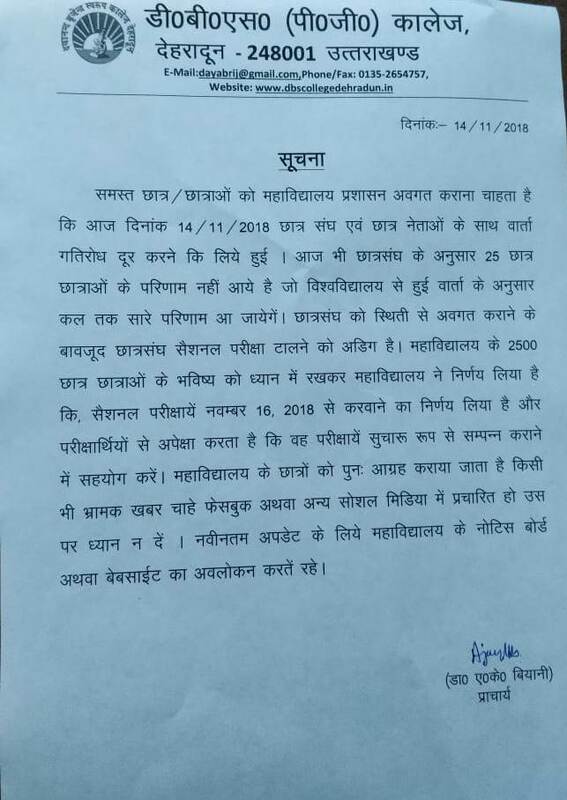 (P. G.) college Dehradun, during special back paper examinations from 29-10-2018 t0 21-11-2018 all classes of UG and PG will be held regularly as per time table. Students attendance is mandatory in the class because after Diwali holidays as per college prospects UG and PG sessional exam are proposed on dated 13-11-2018. 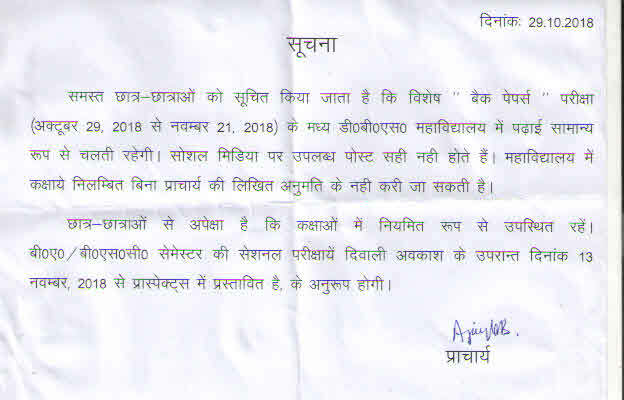 Urgent Notice regarding Ssessional (Internal) Examination new shedule for all UG and PG students of DBS (PG) College Dehradun. 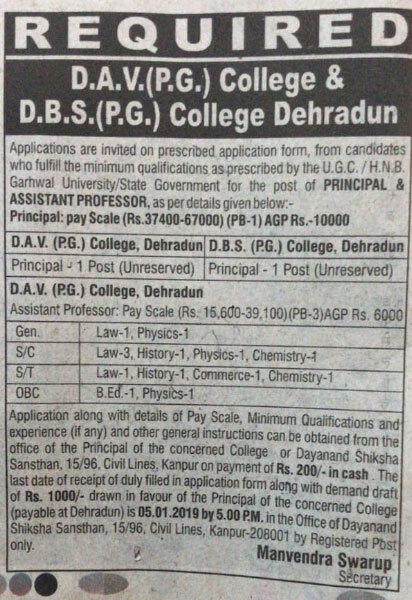 Notice : Application invited for the Post of Principal and Asst. Professor. The college is first choice of top grade students of the region. The college cut-off for B.Sc General Course (Physics, Chemistry and Mathematics) for the year 2018 was ~ 87% which matches with some of the best science colleges of the country and reflects that the college has successfully maintained its place as one of the finest within the University. The college encourages a quest for knowledge that is rooted in an ethical understanding of the world that we inhabit. It has made significant and unparalleled contribution to Society in terms of producing numerous dignitaries scholars and intellectuals who served different domains not only in our own country but even at international levels. Over the years, the College has built up an impressive infrastructure even though it is constrained by the availability of space. The infrastructure includes a well-stocked Central Library, Department libraries for Science subjects (Post Graduates) and a Book Bank for needy students. The College has Computer Labs and 10 Science laboratories. The English Language is compulsory in B.A First Semester. Preference for other two subject combination will be permitted on the basis of merit and according to sanctioned limit of seat in individual subject. The Subjects available are – Hindi Lit., English Lit., Economics, Sociology, Geography, Mathematics and Defence & Strat. Studies. 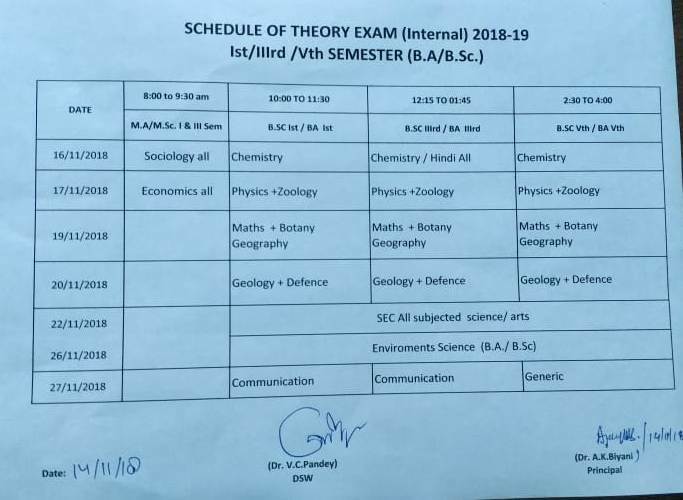 Only those students can opt Geography who had this subject or Mathematics at Intermediate level and similarly Mathematics will be given to those students who have studied Mathematics at Intermediate level. *Qualifying examination for admission in Economics is B.A with Economics or graduation in other streams.